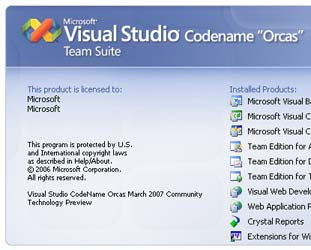 After completing the massive Visual Studio "Orcas" March CTP download and unpacking the VirtualPC image, I decided to put Orcas through its paces with the Q4 2006 SP1 r.a.d.controls for ASP.NET. Understandably, the current r.a.d.controls installer does not add the r.a.d.controls to the Visual Studio Toolbox, so to begin we needed to add the r.a.d.controls to the toolbox manually. Once that was complete, we could easily drag and drop our r.a.d.controls onto the page. At first glance, the Q4 controls seem to work fine in the new IDE. Even the new Split view seemed to work flawlessly with the controls and their Visual Studio SmartTags. Other than that, though, the r.a.d.controls seem to be ready to embrace the new Visual Studio version. Check out my full screenshot gallery of the new Visual Studio Orcas test to see everything in action. The gallery has 33 screenshots of the new Visual Studio version, all with captions. Enjoy! Those TypeLibBuilder errors you're seeing look like a potential showstopper for doing much with this CTP, although I've not run into the issue you're seeing *yet*. I've just blogged my first impressions of Orcas over here. Could I ask, did the VM run really really slowly at your end too, or is it just me needing more RAM in Vista? Thanks for the comments. Hopefully you won't run into these errors because they do pretty much kill any client code IntelliSense functionality. I'm going to try re-installing my VPC image and see if perhaps my efforts to install ASP.NET AJAX were part of the problem. I did find the VPC image to be slower than "usual". I gave my VPC 512 MB of RAM on XP (Core 2 Duo ThinkPad), and the experience wasn't terrible except for occasionally lagging type (which is very annoying!). Let me know if you're able reproduce the TypeLibBuilder errors. I'd be interested to know if anyone else runs into that problem. I've posted a workaround for the TypeLibBuilder error at the Web Tools Blog. This should unblock the road. Please let me know if you guys see any other issues. Glad to see the workarounds (and happy to see you read the blog!). I will give those settings a shot and see what happens. If I get improved results I'll definitely post a follow-up post here.